The Lakewood neighborhood is one of the prettiest residential areas of Dallas, featuring winding, hilly roads and lovely homes. 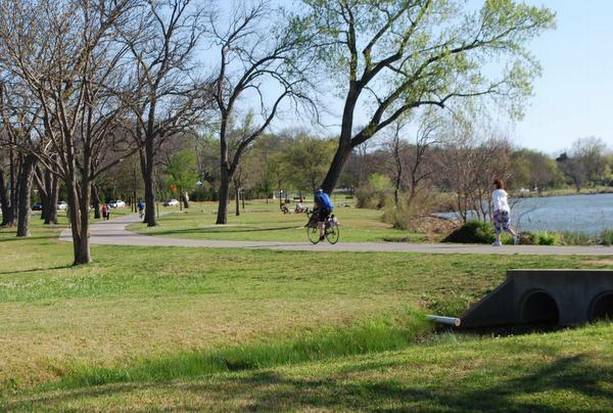 It’s a great option for a self-designed residential run, or as part of some running around White Rock Lake. The neighborhood is just to the west of White Rock Lake, off W Lawther Dr., south of Mockingbird and north of Gaston Ave. Rather than a specific route, just do a random route around these pleasant, sidewalked roads! This can be combined with Swiss Ave., the northern part of which is just south of the Lakewood Neighborhood. A National Historic District, this is a planned, upscale residential community dating back to the late 19th century. A lovely, tree-lined street with gracious homes, well set back, and a grass median through the middle. Swiss Ave. runs for 2.5 miles. The adjoining neighborhood is also lovely for running. A 'design your own' run. Several miles possible in the neighborhood. Any point west of White Rock Lake off W Lawther Dr.